Large energy, gas, and water utilities have looked to Marketing Messages for over 30 years for professional energy voiceover services, as have over 150 smaller energy-related contractors and service providers. How can we make our customers more receptive to using our phone and web systems? How do we make the experience as pleasant and calming as possible? How do we use this experience to reinforce our brand? The professionalism and personality of a voice talent is key ingredient in the answers to these questions. 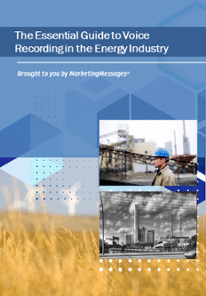 We have provided our voice recordings to over 150 energy-related organizations over the past 30 plus years – from large electrical, gas, and water utilities to small and medium sized HVAC contractors, oil dealers and other energy-related concerns. How About An Audio Demo From A Voice Artist? We are happy to provide a customer energy voiceover demonstration using a script you provide. Let us help you choose a Voice Artist to hear.